The purpose of this study is to determine the effects of administering “distracter” tasks to two groups of participants (surgical residents or “learners”, and experienced surgeons — “experts”) when performing a simulated laparoscopic task, on the level of the surgical task performance. This study reports initial results from the exploration of a novel approach to assessment of laparoscopic surgical skill. 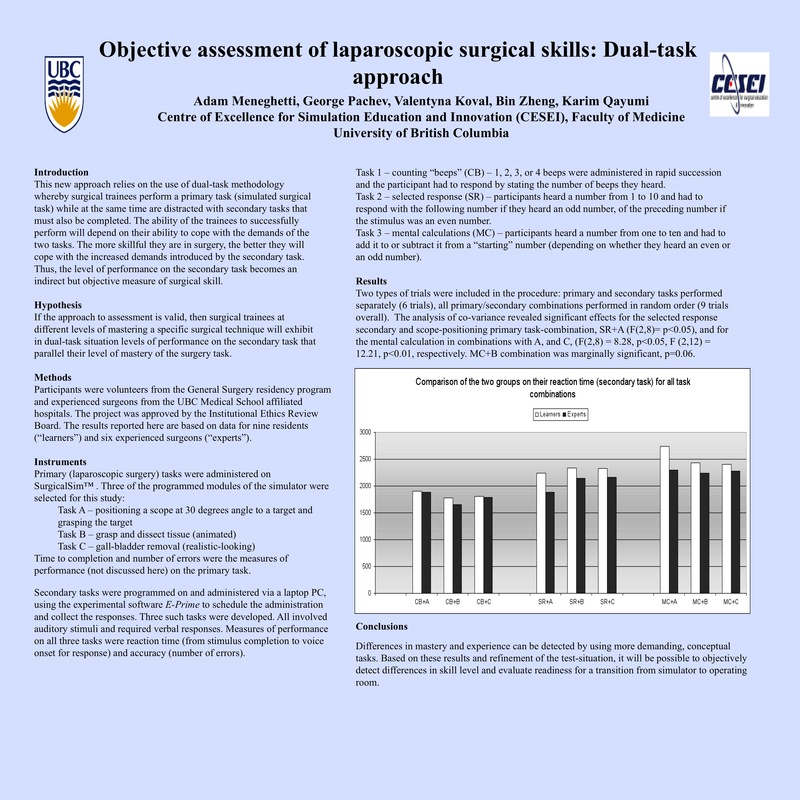 The Dual-task approach states that performance on a secondary task (e.g., response to a signal or a question) will be indicative of the skill-level of a surgical trainee, when the task is performed concurrently with a surgical task. To test the model, we asked residents and practicing surgeons to perform three laparoscopic surgical tasks on a virtual reality trainer (SurgicalSim ™), either alone or concurrently with one of three secondary-tasks of varying difficulty-level (responding to tones, selective responses to questions and mental arithmetic). Outcome measures were: completion-time and number of errors for the surgical tasks; reaction-time and accuracy, for the secondary tasks. Participants performed all tasks and task-combinations. Order of tasks was randomized. Performance levels on the tasks alone were used as statistical control. Both groups exhibited practice effects in performing each of the simulated laparoscopic tasks across the four repetitions. The “learning curves” were similar, representing reduction of time for performance that could be described with a single function. The “number of errors” measure yielded different patterns for the two groups. Concurrent task performance resulted in an increase in reaction time and an increase in the number of errors for all three secondary-tasks. For both groups, the selected response and mental calculation tasks resulted in more errors in the surgical task performance than the counting beeps task. Based on these results it is possible to objectively detect differences in skill level. The dual-task approach to assessment provides an objective albeit indirect way to evaluate skill-level in surgery and evaluate readiness for a transition from simulator to operating room. Future research will involve the selection of different secondary tasks that are more sensitive in detecting differences in skill level.